Eeee! I love Babymouse and I didn't know what/when the next one would be! Color me excited (and pink)! I love Babymouse! 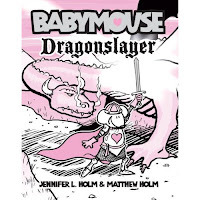 They're just so cute....the pink and black and white illustrations, and the fun little plots that take the reader into Babymouse's imagination!